excellent site on the subject! "I'm really glad we were able to find the time to chat today...thanks for your time sir." Harv: "Ahhhhh cut it out! I'm just happy to be able to work on something with you that will make you famous (laughs)." "(Smiling) Well then, where did we leave off?" Harv: "Well, it was right around the time I was in Great Britain....(pauses)...I think." "From this point on, the events and times are very confusing, as everything happened so fast. 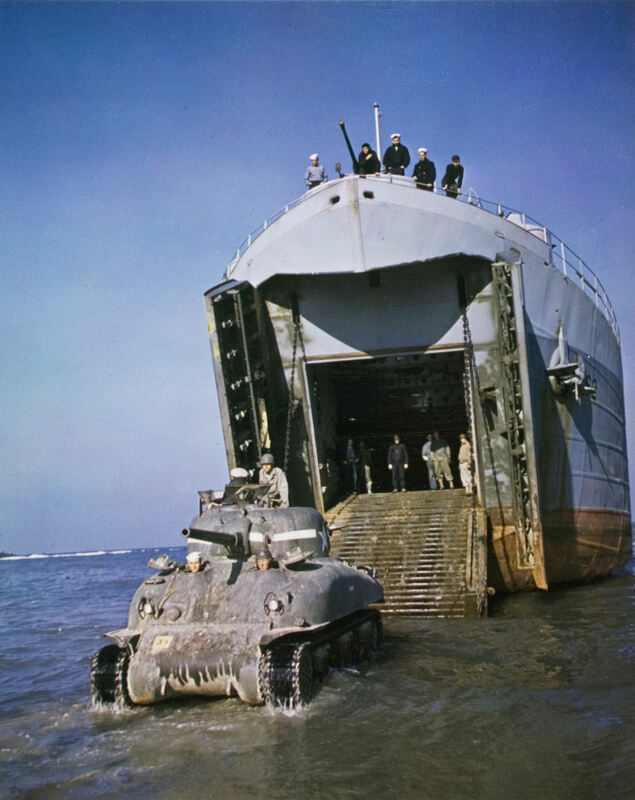 We were ordered to close the base at Deptford and move all of our equipment to southern England, either Portsmouth, or Falmouth.."
Harv: "We were put aboard an LST (can't remember which one) as a repair unit, and then came D-DAY where we went across the English channel, landing at Omaha beach.."
"Tell us what it was like Harv, to the best of your knowledge." Harv: (Looking distraught) "What carnage, it was to horrible to even describe it.... Troops climbing over the bodies of their comrades just to get off the ship. Those that did get off didn't even get very far onto the beach. It was a slaughter. I am sure that our leaders had no idea as to what we would run into. Bad weather, more shore guns , more air attacks, and more mines and other obstacles to prevent our landing craft from getting to the beach.."
"Did the CO give clear orders as to what to do next?" Harv: "You can say that... ." My group finally found out what we were there for. It seemed our job was to make temporary repairs on damaged ships so that the Gi's could get off the beach and then to go back to England for more troops and supplies. We made several trips off our ship to go to others and do the job necessary to fix and supply and such. "So you basically became the maintenance crews of the invasion?" Harv: "Yeah, we only made two round trips as far as across the channel to England and back, but some ships made many more....those that weren't sunk or damaged to bad after the second trip that is."